Whether you enjoy crocheting large quilts or prefer a simpler project, it's always a good idea to have a few tricks up your sleeve to add personal touches to the edges of pieces. The special touches on the edges can pull an entire design together. Check out these cute crochet border ideas, from a basic edge to more elaborate spirals and even elephants, and then grab your needle and yarn, because you'll want to try these out. The single crochet border edge is one of simplest options. Start about two or three stitches from your corner. Place your hook through both loops and grab your yarn. Work a single crochet through each stitch all the way around. Check out the video below to see how to tackle the corners. The scalloped edge offers a little more texture and is a great option for adding detail to the edge of a blanket. This traditional edge is a popular choice. Push your needle through both loops on the edge of your piece (a few stitches from the corner). This edge is a combination of single and double stitches, making it a great option for beginners and experts alike. Check out the video below to see the stitch. The pom-pom edge is a really cute way to add unique texture. This type of stitch is a fun choice for baby blankets, booties and scarves. This type of stitch works on any edge. Unlike other edges, you'll want to attach the yarn to your edge with a small knot. (This will keep it in place so you can stitch more easily.) Check out the video below to see how this stitch pulls together. The spiral edge is a really unique border. You can add these edges to a blanket, pillow or scarf for extra texture and movement. For extra pop, use an ombre-colored yarn. You'll want to space out your spirals by adding about five stitches between. Check out the video below for detailed instructions on how to finish this fun edge. Fan filet edging is a sweet way to add details to the border of a blanket. The edges look a bit like shells or flowers. You'll want to use two different colored yarns to really make the edge pop. The initial chain should match your project (in multiples of six, plus four). See the video below to watch this beautiful technique come to life. Queen's lace edging is a beautiful stitch for adding delicate details to your project. This type of edging looks lovely on baby bonnets, dresses, scarves and hats. This edging is a bit more technical, and you should know how to do chains, a slip stitch, single crochet, double crochet and treble crochet. This pattern is a multiple of 16 plus seven. Check out the video below to see the stunning results. This is a fun twist for a project border. This technique adds texture and shape. This stitch is a multiple of seven. The technique uses single stitches, chains, slip stitches and double crochets. The video below shows you how to add this technique to the edges of your project. This edge is easy enough for beginners to tackle. The three-petal scalloped edging is another technically complicated edge. Before you tackle this edge, you should know the chain stitch, slip stitch, single crochet, double crochet, triple crochet and triple crochet three together. Reminiscent of Queen's lace edging, this technique is delicate and fancy. Watch the master at work on this beautiful stitch in the video below. This is a really fun way to add personality to the edges of your projects. If you add a foundation stitch, you can use this edging on any project (even traditional blankets!). 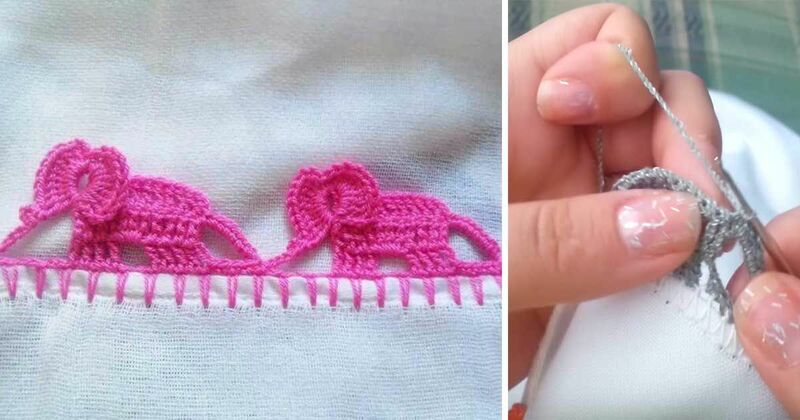 Kids (and elephant lovers) will enjoy this sweet detail. The edging uses double crochets, chains and slip stitches. This is a pretty simple way to add fun detail that even beginners can tackle. Check out the video below (in Spanish) to see another variation of the stitch. The video has English instructions in the detail section. The next time you're wrapping up a crochet project, take a little extra time to add one of these adorable edges for extra pop! 11 essential supplies every crocheter must know. Did you know about #10? If you're just starting out in the wonderful world of crocheting, trying to figure out what you need, what is actually useful, and what is just for looks can be really hard. If you're looking for a delicate detail to add to your crochet pattern, you'll love these sweet heart-shaped stitches. A new DIY project has taken Pinterest by storm. Originally created by designer Johanna Hyrkäs, this project is guaranteed to wow anyone who sees it. Adding fun details to your crochet projects is a simple way to take your work to the next level. Creating fun crochet flowers gives a bit of femininity and texture to any project, and many of the crochet flowers are pretty simple to do. You'll love these easy ways to make snuggly socks for all the family. Crochet Lovers has put out a YouTube tutorial that walks you through the step-by-step process of making one adorable item! Ashley Ann Photography demonstrates how, sometimes, you just need a little bit creativity to transform the most dull-looking materials into gorgeous pieces. We all make mistakes: Learn how to fix them! Laura Ann Coia, from 'Sew Very Easy,' has put together an excellent tutorial to make these beauties.